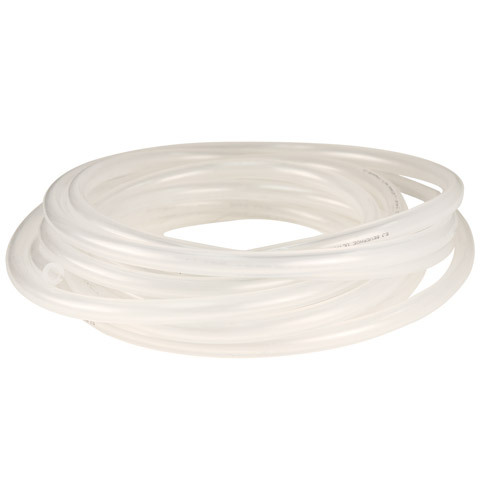 3/8" ID x 5/8" OD x 1/8" Wall EJ Beverage Ultra Barrier Silver™ Tubing | U.S. Plastic Corp.
EJ Beverage Ultra Barrier Silver™ tubing is constructed of a unique compound that provides for an excellent alternative to PVC. The silver lining used in Beverage UltraBarrier Silver™ has been proven to be 100% effective against the top 4 beverage spoiling bacteria* up to 2,000 liters flow. PVC free and BPA fee, it also contains no DEHP, phthalates or other plasticizers. Environmentally friendly production and it does not emit dioxins. Tubing offers extremely low extractables and extremely low leachables. It is highly flexible and will remain flexible at lower temperatures. It has ultra-low permeability and offers superior barrier properties. Temperature range: -40°C to 52°C (-40°F to 125°F). Note: These are standard rolls, thermoformed/coiled tubing is available for special order. Standard lengths of 100', sold in 1' intervals. *Beverage spoiling bacteria tested: Acetobacter lovaniensis, Wickerhamomyces anomalus, Lactobacillus brevis and Pseudomonas aeruginosa.